Yesterday we published a statement by the Federação Anarquista Gaúcha (FAG) about a police operation in Porte Alegre (Brazil). Today we re-blog a statement that was published by Agência de Notícias Anarquistas-ANA and translated by Insurrection News. Originally published by Agência de Notícias Anarquistas-ANA. Translated by Insurrection News. Book Fair of Porto Alegre. 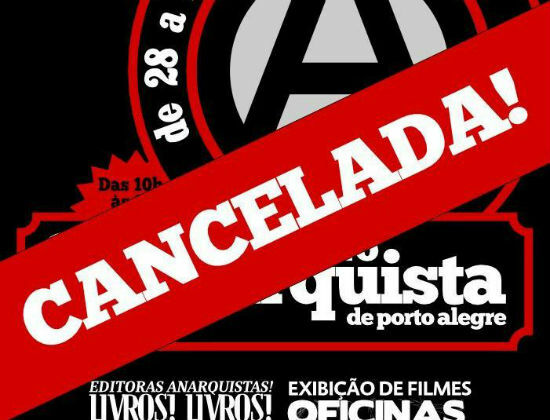 Due to this context of repression and persecution of anarchist groups and individuals we decided to cancel the Anarchist Book Fair of Porto Alegre this year. We disappear, below the radars, only to reappear at another point without ceasing to build spaces and moments of freedom. The map is not the territory, and for this the State and the Capital are myopic. that there is no freedom in democracy and the capitalist system. This freedom, in fact, never existed under any government, except as a mere illusion to be dispelled as soon as it was not more in the interests of capital. This is what is happening now in several countries, with the growth of repression, fascism and xenophobia. activities that came from near and far, the people who were already moving here and also to break this cycle, in what would be the eighth consecutive year of anarchist book fairs in the city. economy is going well” while poverty is only increasing. In this, they use de factoids and physical violence seeking to maintain control over the minds and bodies of the people they intend to dominate. As we try to blow up with bottle molotovs, we grow stronger. Let us bring solidarity to all those who are suffering from criminalization. From Italy to Argentina, from the United States to Russia, our struggle is the same. We do not surrender and we will not lose our ardent desire for freedom!